The Seguro Pendant from Tech Lighting is stunning with its beautifully transparent colored glass body. 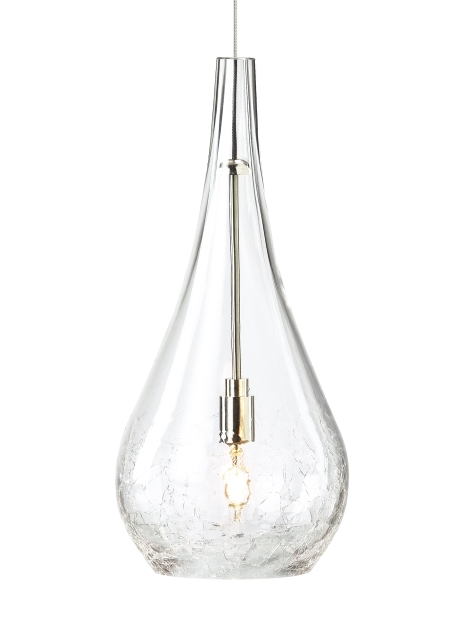 With its delicate teardrop shape and unique crackle texture on the lower third of the bulb the Seguro Pendant is a sure showstopper. Pair this elegant pendant with one of our multi-port canopies to create a custom chandelier that would beautifully accent any space. The Seguro is available in two beautifully textured glass finishes, Clear and Smoke and comes in two contemporary finish options. Scaling at 5" diameter and 11" in height the Seguro is ideal for kitchen island task lighting, home office lighting and dining room lighting. Your choice of Halogen lamping ships in the box saving you time and money. all lamping options are fully dimmable to create the desired ambiance in your special space. Includes (1) 35 watt low-voltage GY6.35 base Xenon bi-pin lamp and 6' of field-cuttable suspension cable. For use with 24 volt transformer, add suffix -24 to item number.